This is the fifth in our series of looking back at the Georgia filming locations for The Dukes of Hazzard. It’s a little known fact that only the first five episodes from season one were filmed in Georgia. In fact, most of the filming took place during the winter of 1978 in and around the towns of Covington, Conyers, and Social Circle. After that, filming moved to the Warner Brothers Burbank Studios in Burbank, California and Walt Disney’s Golden Oak Ranch in Newhall, California. Synopsis: Uncle Jesse comes out of retirement and makes up a fresh batch of corn whiskey for a contest put on by the government for fossil-fuel alternatives. No surprises here. “High Octane” starts with Bo and Luke jumping the General Lee over a flatbed semi-truck blocking their path. The boxes on the trailer were empty in case somewhen went awry with the jump. This was also the last time the General Lee performed a jump while filming in Georgia. In the background, the General Lee is seen heading to the Hazzard County Courthouse. The boys are on their way to meet up with Uncle Jesse. The Duke boys meet Uncle Jessie in front of the Hazzard County courthouse. The boys are here to meet with their parole officer to do their quarterly check-in. Little has changed in the old town square since this episode was filmed. The Duke boys and Uncle Jesse make their way up the steps of the Hazzard County courthouse. The green building in the background is the Mystic Grill. It was a popular destination frequented by vampires in the television series The Vampire Diaries. A sign on the door of the courthouse catches the Dukes’ attention. The Federal Energy Commission is giving away $20,000 as the first prize in a search for a substitute for fossil fuels. Uncle Jesse is startled by Cooter after he climbs from under the General Lee. Cooter was fixing a shorted-out taillight so the Duke boys wouldn’t get a ticket from Sheriff Coltrane. Uncle Jesse, the Duke boys, and Cooter take the cover off the old moonshine still. Hidden in the backwoods, this still used to make some of Uncle Jesse’s finest white lightning. Time to fire it up and make a batch of “alternative” fuel for the Federal Energy Commission contest. Rosco and his deputies set up a road block to catch Uncle Jesse transporting moonshine to the Department of Environmental Protection. Rosco flags down Uncle Jessie in his moonshine runner. Known as Sweet Tilly, this 1971 Ford Galaxie was Uncle Jesse’s moonshine hauler back when he was running ‘shine. Uncle Jesse waits for Rosco to finish looking over Sweet Tilly for moonshine. Needless to say, Rosco comes up empty handed. That’s because Uncle Jesse is a master at hiding moonshine in his old moonshine runner. Boss Hogg and his driver arrive at the Department of Environmental Protection. The are bringing the moonshine they confiscated from Uncle Jesse to be tested to see how it performs as an alternative fuel. Unfortunately for Boss Hogg, the moonshine turns out to be water. This location today is a hospital. Location: Piedmont Rockdale Hospital, 1412 Milstead Avenue NE, Conyers, Georgia 30012. In the end, Uncle Jesse delivers his moonshine whiskey to the Department of Environmental Services. The judges are impressed with the results of the combustion test and promise to send the moonshine to Washington D.C. Uncle Jesse gets a bit frustrated since he thought he won the contest based on how well the moonshine performed. As usual, government red tape and bureaucracy come into play, even in Hazzard County. 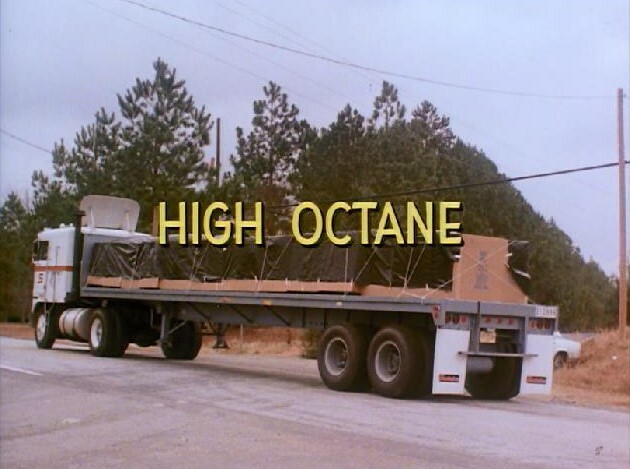 “High Octane” was the final episode shot in Georgia before filming moved to California. The series seemed to lose a bit of its Southern charm after the move, but one thing is for certain. The Dukes of Hazzard was still one of the most entertaining shows on television during its seven year run.